Newton’s three laws of the physical world are beautifully illustrated by Der Lauf der Dinge (‘the way things go’). This is a 1987 video by the artists Peter Fischli and David Weiss. ‘It follows the domino effect of a series of simple objects such as string, soap, styrofoam cups, rubber tires, plastic pails, balloons, and mattresses; when combined with fire, gas, and gravity, these objects form a hypnotic chain of kinetic energy that disturbs the viewer with its chaotic potential. [ 1 ] Disturbed enough to want a pint of Guinness? [ 2 ] If you haven’t seen it on TV, have a look on Youtube and you will see the Guinness advertisement using the same idea to sell pints, as does the Honda Accord ad to sell cars. [ 3 ] Art and advertising have collided, the boundaries are blurred and it will be helpful if you keep in mind the ‘hypnotic chain’ of The Way things go as we explore how advertising and ‘curated’ art impact on a small city, in this case Cork, in Ireland. Isherwood’s Saatchi and Saatchi is an advertising company; however, they dropped the word ‘advertising’ from their name in 1992 to become an ‘ideas’ company. 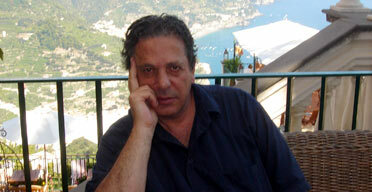 Charles Saatchi, the art collector, along with his brother Maurice, founded Saatchi and Saatchi; however, they parted ways with the company in 1995. Damian Hirst, whose career began with the help of Charles Saatchi, became an international brand name associated with controversy and tabloid sensation. The rise of the contemporary curator can be traced back to the same period as the emergence of Hirst and Saatchi on the London art world, which coincidentally also coincides with the rise of branding. Are they interlinked? Certainly branding is linked to Saatchi’s advertising career and to Hirst’s profile; Hirst’s first group exhibition was not only as an artist but also as a curator ( Frieze ). But what did this grow out of? Reaganomics, Thatcherism, the ’80s? “The astronomical growth in the wealth and cultural influence of multi-national corporations over the last fifteen years can arguably be traced back to a single, seemingly innocuous idea developed by management theorists in the mid-1980s: that successful corporations must primarily produce brands, as opposed to products.” [ 7 ] This trend is well documented in Naomi Klein’s book No logo [ 8 ], in which she reveals that ‘branding’ can lead to a rejection of responsibility to the local as the multi-national strives for maximum profits by outsourcing all production internationally. The organisation essentially becomes a virtual company without loyalty to any one locality. The London ‘art world’, even if it has global aspirations and consequences, is an insular and localized place, as Charles Saatchi reveals when he says “Dealers tend to buy artists that other artists they already show recommend. If you're not in the loop, if you didn't go to the right art school, if you don't know the right people who have the right dealers, it's very hard to break in.” [ 10 ] The most prominent artist associated with Saatchi is of course Hirst. Hirst’s fame has reached the point where the Glucksman Gallery in Cork has put Hirst’s name at the top of an exhibition billing to advertise their exhibition, The Inevitable show (reproducing fame). The Glucksman appropriates Hirst’s name but is not exhibiting his work. What they exhibit is a recent exhibition advertisement for one of his shows (signed by Hirst) in the gallery. This apparently allows the gallery to use Hirst’s celebrity name ‘legitimately’ as a signature draw-card on the bill. In advertising, it might be known as a guerrilla campaign, but in reality it is a cheap gimmick. It’s important to note that the Hirst poster in the gallery still reads as an advertisement - if only for celebrity memorabilia. Another example of where contemporary art and advertising collide is the John Lewis ads that used their commercial products to make figurative shadows. 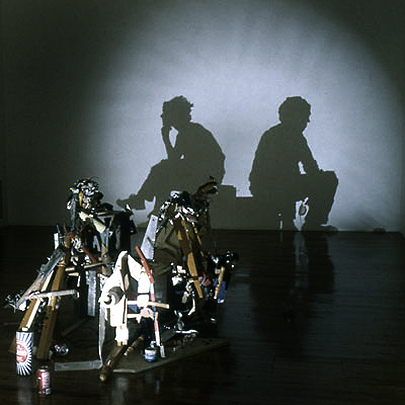 It was obviously derivative of Sue Webster and Tim Noble’s [ 11 ] art. Now one might argue that Noble and Webster do not have a patent on shadows and are heavily indebted to Shigeo Fukuda [ 12 ]; however, it is an example of identifiable cross-referencing between contemporary art and advertising. Even more explicit is the current exhibition of Takashi Murakami at the Brooklyn Museum. “Mr. Murakami, who is frequently called the Japanese Andy Warhol…” [ 13 ] has installed a Louis Vuitton shop or boutique “smack in the middle of an exhibition in one of the borough’s most venerable art institutions?” [ 14 ] Or in Dublin, the Hugh Lane Gallery is currently exhibiting Julian Opie’s electronic billboards that ‘advertise’ Julian Opie’s work on O’Connell Street. Opie until recently was on the Board of the Tate Modern. If the Glucksman influences the NSF one might ask who is influencing the Glucksman? One needs to look into the Glucksman’s bookshop. There amongst the books that venerate the gallery’s architecture you will find Tate Modern-branded product for sale. A British cultural institution’s commercial product being sold by an Irish university gallery’s shop seems odd, but then the Tate also regards itself as an international ‘brand’ [ 17 ] and it openly states they want to make money. [ 18 ] The Tate’s commercial creep into the Glucksman reveals they are also selling the Glucksman a Krensian vision – but what is a Krensian vision? In the preface to The Picture of Dorian Gray (1890), Oscar Wilde stated that “All art is quite useless.” Well, not any more. Advertising and cultural institutions have found a use for art and this can be seen at the Tate Modern when you visit the shop attached to the current DADA exhibition. There you can buy a catalogue for under £20 or you can buy the limited edition ‘Man Ray-inspired’ chess set for £30,000! [ 22 ] Modernism once offered different possibilities, for it recognised the pitfalls of the future. “…to prevent art’s authenticity, criticality, and life force from becoming one with advertising, propaganda, and the maw of capitalist consumerism, you need to keep art separate, pure, and involved with questions of its proscribed disciplines. Such a strategy would preserve fine art.” [ 23 ] It would seem the ultimate post-modernist irony that the museums which built their identities (brand or reputation) on the Modernist project would ultimately sell out to satiate their contemporary commercial aspirations. Curators seem willingly involved and are playing the role of ‘middle management’ in this process. Charles Satchi might say that is just the way things go; however, does Krens’ departure from the Guggenheim suggest that things are about to change? And if so, how long will we have to wait for that change to filter through the system and to Cork? John Kelly is an artist based in County Cork. He is represented by Agnews in London Niagara Galleries in Australia. His work can be viewed at the Fenton Gallery in Cork. 16 Fiona Kearney’s profile is available from the Glucksman’s web site . 24 Through the three Cork commissions, the NSF openly revealed that they are prepared to discriminate against the local – see this related article .